Mark Schoon discusses his work for “Defining Place,” an exhibition of photographs by Schoon and Dominic Lippillo that was a focus of the September 2013 Art Night. For the September Art Night, the first of the 2013 fall semester, artists flocked to campus for an energizing get-together with food and camaraderie. “I’m excited to see who’s going to come tonight,” said UA student Sarah Austin as early arrivals began filtering in. Since 2003, Art Night has served as a monthly gathering where artists and art lovers view, present, discuss, and sometimes create art and crafts. The event takes place at multiple local galleries, which offer extended hours — and often food and live music — for the occasion. Originally held on the first Thursday of each month in both Tuscaloosa and downtown Northport, the event was split this summer: in Northport, Art Night still happens every first Thursday, but Tuscaloosa galleries now hold their events on the first Friday of each month as a new celebration called “First Friday.” Galleries on the UA campus open exhibits and host receptions on either or both nights, depending on the artists’ preferences and the scheduling of other campus events. September’s Art Night was celebrated in both the Sarah Moody Gallery and Sella-Granata Gallery. As the night progressed, groups would form before a photograph or display and discuss the image before them. Discussions of techniques applied, evocative shading and symbols, and the effect on the viewer overlapped each other in both galleries. “It was really fun to see my artist friends,” Kristin Kelley said. Every Art Night offers a special treat to its participants. 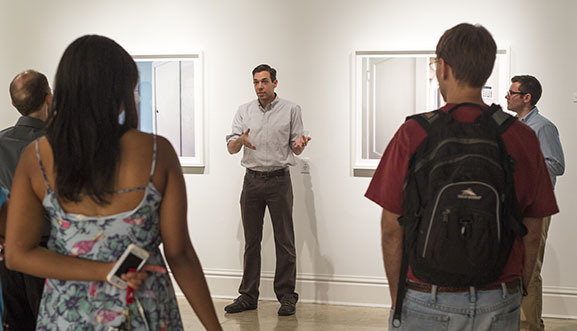 In September, the Sella-Granata Gallery featured artists Dominic Lippillo and Mark Schoon, who gave a walk-around lecture and Q&A session on their exhibit, “Defining Place,” which focused on domestic objects and images. Off campus, MFA student Claire Lewis Evans will join other local artists for Art Burn in the Kentuck Courtyard of Wonders. For more information, visit the event’s Facebook page. Friday night (October 4), Tuscaloosa’s First Friday event will feature “Ulpturescay,” recent works by advanced sculpture students, at Harrison Galleries, 2315 University Blvd., from 6 to 9 p.m.
Art Night and First Friday are free and open to the public. For more information about events on the University of Alabama campus, visit art.ua.edu. To learn more about events in downtown Tuscaloosa and Northport, visit www.tuscarts.org.